As a marketer, if you are wondering if you can use print to engage on social media…the answer is YES! Take a look at how Integ used a Christmas Party event invitation to engage with clients and drive awareness about the event on social media. As we started the brainstorming process, we first established our main goal was to engage with our audience on social media by utilizing a print piece. This added value to our annual invitation and created an ROI not typically thought of with a printed piece. Our Creative team then crafted the idea of a wearable Santa beard that invitees could wear, take a selfie and post to Instagram or Facebook with a hashtag for a chance to win an Amazon gift card. 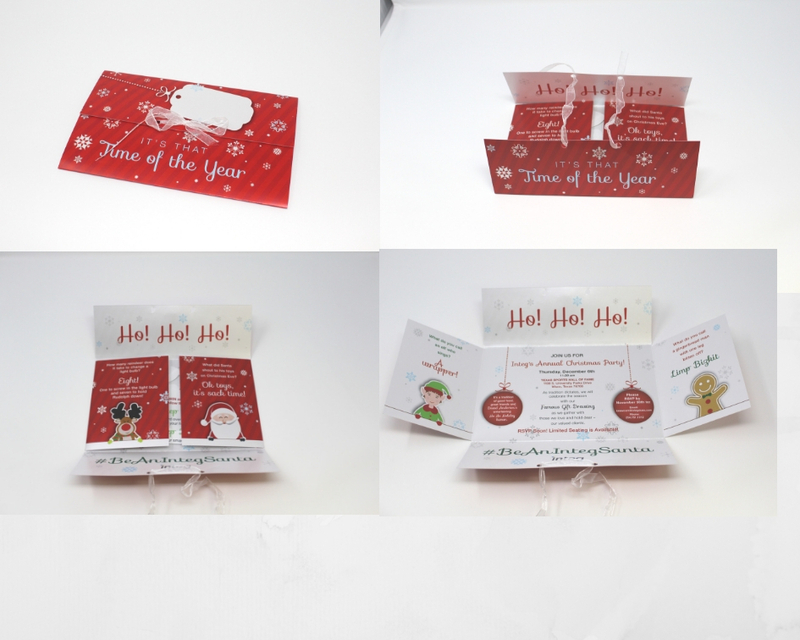 This piece also showcased our digital printing capabilities but most importantly created social engagement with our clients to create a buzz about our Christmas party on social media. An invitation designed hit the high notes. In light of our fun relaxed Christmas party atmosphere, the design of this piece reflected a light heart Christmas look and feel. Created as a variable data piece, personalized with the first and last name printed on the nametag on the outside of the invitation, each client felt special receiving their custom invitation. Printed on our HP Indigo in 4-color with 6 hits of clear on top of 4-color diagonal lines, added a subtle design element to the piece. Included on the piece, (top right) was a clear ink snowflake hinting a beautifully created embellishment. Clear ink is a great way to offer a subtle look with a huge impact. The piece was designed as an iron cross fold including the timeless holiday jokes from our CEO, David Anderton. These jokes are a staple of the Integ Christmas party each year. Information about the party was included on the inside. 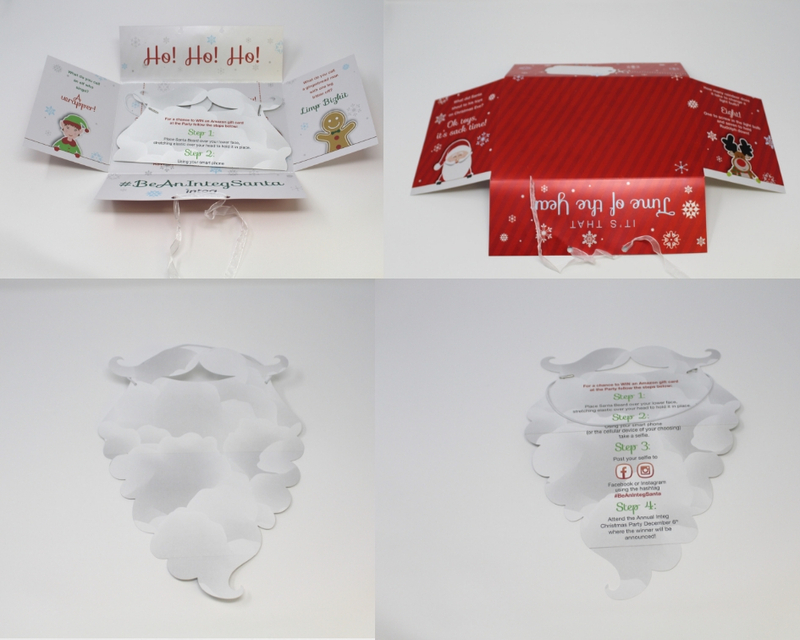 Once completely unfolded, the die-cut Santa beard was folded in a tri-fold with step-by-step instructions on how to put it on and enter for your chance to win. Check it out for yourself in the images to the right! 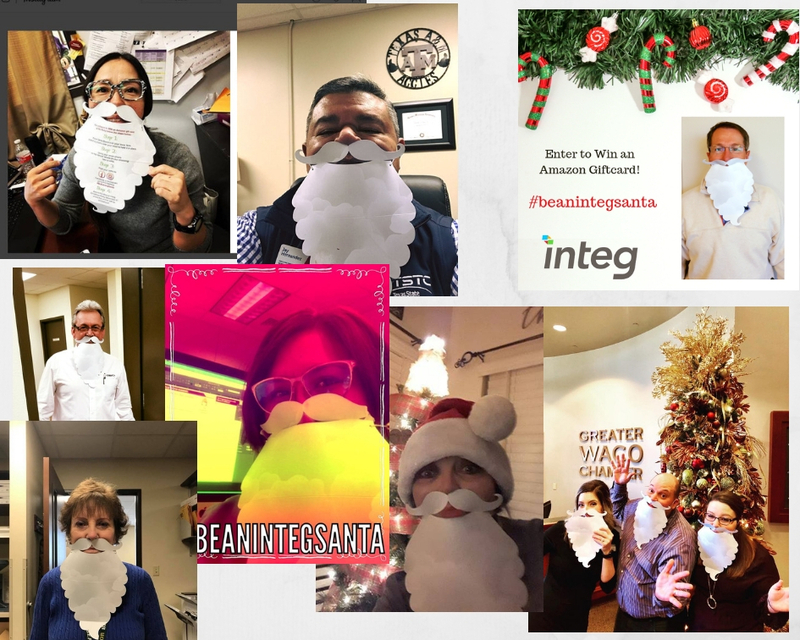 The invitation was sent out to 460 clients and 24 entries engaged with #beanintegsanta on Instagram and Facebook. This is a 5% return! As the marketing department jumped for joy, our brand awareness in the local community organically increased as our local Chamber engaged and many other businesses. As a result, B2B Print marketing works. Using direct mail to engage with digital marketing platforms is an innovative way to reach your audience. In conclusion, as social media influences grow in both B2B and B2C marketing arenas, print projects are a tangible piece your audience can hold up and literally share with their friends and family. Above all, imagine the possibilities with direct mail. If you need help brainstorming using print to engage on social media, our Creative Department is here to help. Our Print and Mailing and fulfillment capabilities can handle the rest! Do you have an idea you’d like a quote on? Contact us today!